This week’s visit to China by Russian Prime Minister Dmitry Medvedev raises questions about whether the potential for developing a genuinely close relationship really exists, especially given the nature of the economic problems currently facing both nations and the different strategic approaches of Beijing and Moscow – internet issues aside. 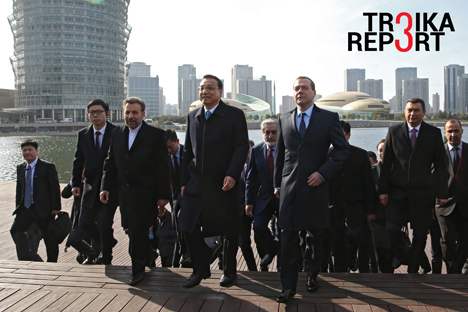 With China presenting both a challenge and an opportunity for Russia’s economic development, this week’s four-day visit to the neighboring giant by Russian Prime Minister Dmitry Medvedev is a critical test of the all-weather partnership. Yet under the present dire economic circumstances Russia can hardly count on a bumper return from cooperation with China, with the exception of large-scale projects in transport infrastructure, the aviation industry, and nuclear energy, which remain on track. Talking to Troika Report, Alexander Lomanov, head research fellow of the Institute of Far Eastern Economic Studies at the Russian Academy of Sciences, set the record straight on the strengths and weaknesses of bilateral interaction. – While Russia is a direct victim of the current spiraling of oil prices, China is thriving on this trend due to lower costs. How can you harmonize economies with such divergent base models? – Do you suggest that providing simply shipping services can generate handsome revenues? – What about the Shanghai Cooperation Organization? Some say there is a divergence of views between Moscow and Beijing on how it actually fits into the mismatched strategic priorities of the two nations. How true is this assumption? “In his presidential address to the Federal Assembly, Vladimir Putin openly and explicitly said that he hoped the Shanghai Cooperation Organization would play a more significant economic role in the region. This has put to rest a dispute among Russian and Chinese experts. It was a long-standing assertion by Russian experts that the SCO is mostly a political and strategic asset, while Chinese colleagues pointed out that for Beijing it was a highly desirable economic tool of development and projection of its interests in the region. Both nations find it unfair that the Internet Corporation for Assigned Names and Numbers (ICANN), which coordinated the Domain Name System (DNS), Internet Protocol (IP) addresses, space allocation, protocol identifier assignment, country code (ccTLD) Top-Level Domain name system management, etc. has its roots in the U.S. government, and is a non-elected body with no legal responsibility to the multi-stakeholder internet community. A proposal made by Russia and China in late 2013 to replace the ICANN, which is still supervised by an obscure agency within the U.S. Department of Commerce, by an international institution was derailed in May 2015 by U.S. Congress, which claimed this was not in Washington’s interests. It is likely that Dmitry Medvedev discussed ways of breaking this monopoly on the internet with Chairman Xi during his visit to China. The opinion of writers may not necessarily reflect the position of RIR or its staff.